I love good deals. They give me a kind of high that I just can't duplicate in any other way. I went to the Dollar Tree again, and got some more stuff. 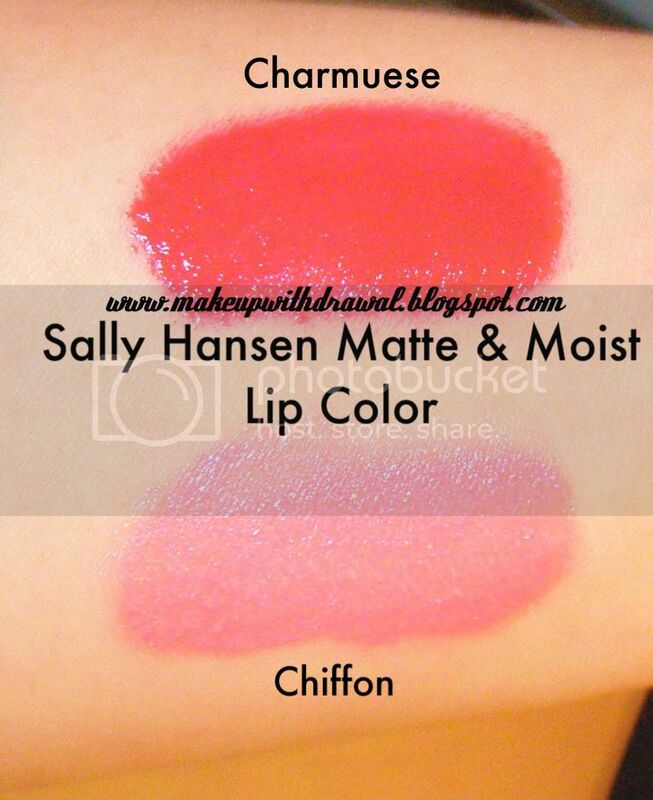 I bought two more Moist & Matte Liquid Colors.I picked up another Charmeuse (a vibrant red) and Chiffon (a hot pink). I really like these, because the color is really opaque and it doesn't dry out my lips. There is one minor drawback, they smell like nail polish. That can't really be good for your lips, so I wear lip primer as a sort of barrier. I also bought six L.A. 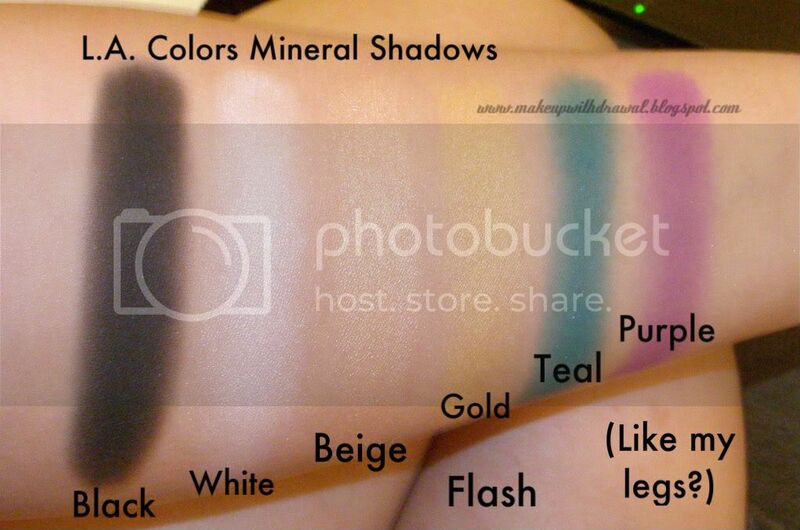 Colors Mineral Eyeshadows and am fairly happy with them. 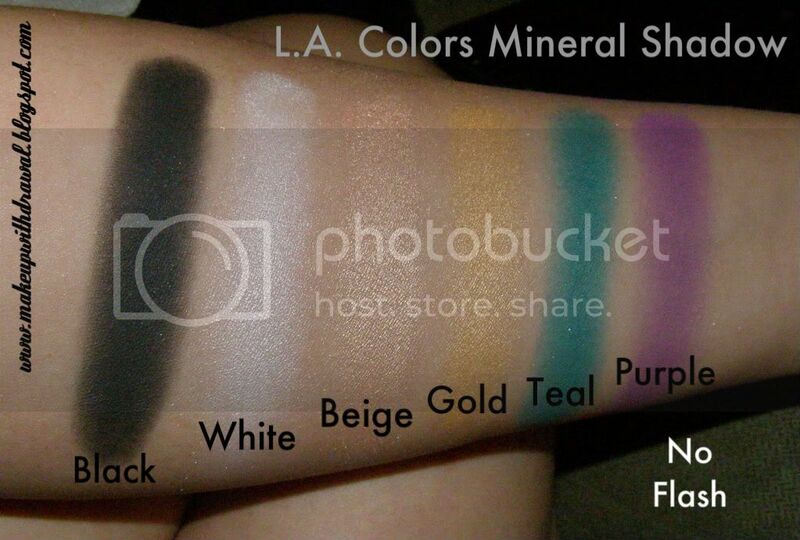 Here's some swatches. Notice how unlike the rest of my fabulous pictures, these aren't done in natural sunlight? That's because I really didn't think they were worth waiting till the next day and trekking outside for. The photos with and without flash pretty much do them justice. Notes: I thought it'd be overkill to swatch each color four times like I normally do, with all the bells and whistles. 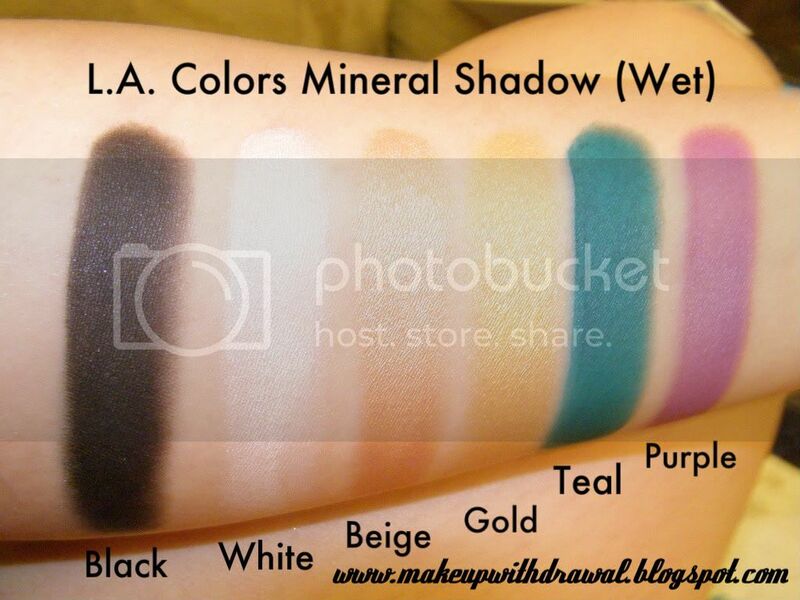 Since I assume you are a benevolent reader and would like me to stay sane, I'll just generalize and say that these shadows look better with something underneath or wet. Black is a matte black with the tiniest particles of silver glitter, not really visible to the naked eye. In the last picture of wet shadows, you can see one sparkle. White is odd. It's like matte and pearly at the same time, which doesn't really make for the smoothest application. Beige is a shimmery champagne peach. Gold is a soft shimmery 20 carat gold. Teal is a really smooth, attention calling matte teal (as the name would suggest). Purple is a matte, ordinary violet. I sort of like the unimaginative naming scheme because everything is pretty self explanatory. In particular, I'm rather fond of the Teal and Beige. Just due to the awesome color of the first, and the soft, champagney glow of the second (which could probably be great even as a highlighter). I think they'are a fantastic value, and I would highly recommend using all of them wet. Well, except for the White. It's just kinda weird. I also raped Target today. Yes, that's right. They had the e.l.f. display finally up and yours truly took every last Elements compact left. All eight of them. Was that a little selfish? I honestly needed them- I had about 24 or so eye shadows in limbo ever since I stepped on one of my 28 slot palettes and destroyed it. Well, my sincere apologies to the people in the area of Voorhees and Cherry Hill, New Jersey. You have me to blame for your lack of compacts. I also bought a single e.l.f. 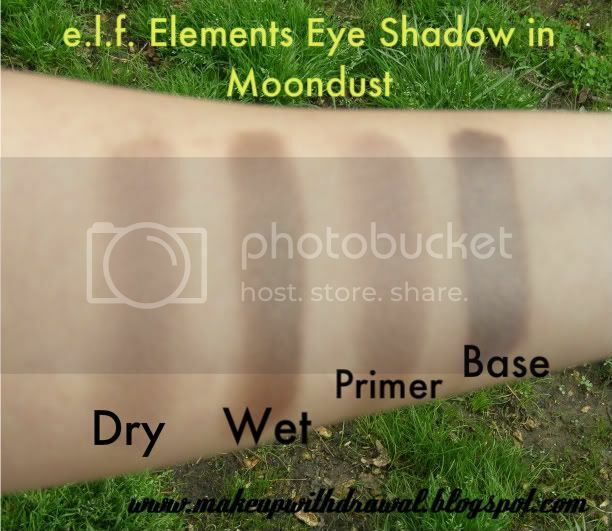 eyeshadow in Moondust, 'cause you know, taupes are my thing and I don't discriminate based on price. 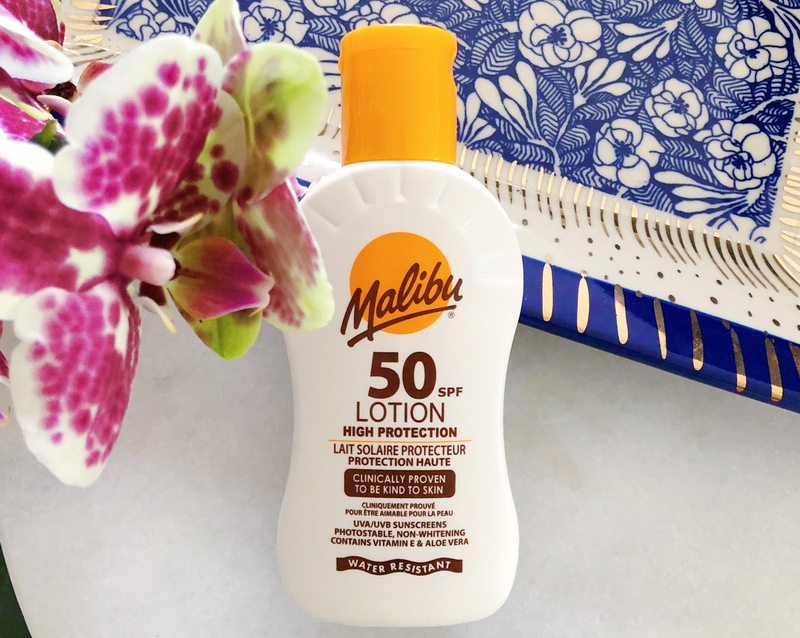 It's very soft but the problem is that on it's own it has very little color payoff and doesn't last at all. But pair it with NYX Jumbo Pencil in milk, and you've got a winner. Of all the taupes I own, this one is the least frosty. In fact, it's quite satiny in texture, with the tiniest bit of shimmer. This picture isn't blurred, honest. The shadow just really wants to crumble off my arm. 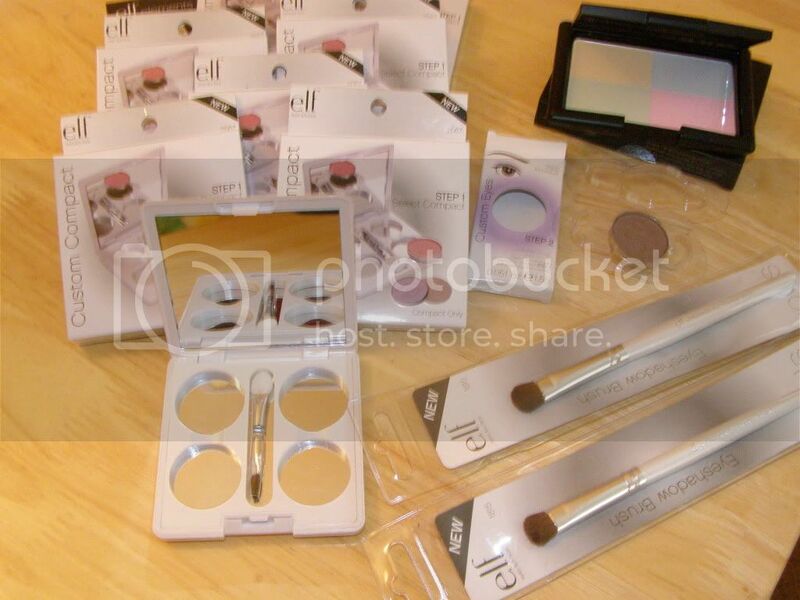 I also grabbed two more $1 eyeshadow brushes because they're so handy for swatching and for day to day use. The last thing that I found interesting and had to try out was the e.l.f. Complexion Perfection powder quad. I'll write a whole review about it, promise. Wow, that Peach shadow looks real nice. I'm sure I have a dupe tho...doesn't make me want it any less. Actually the purple looks quite nice too..
Of course we always want what we possibly already have. Ah beauty, you fickle thing, you. Don't feel guilty about those quads...I bought all 6 that we had at our local Kmart when they finally restocked. Now I want our Target to carry more ELF. 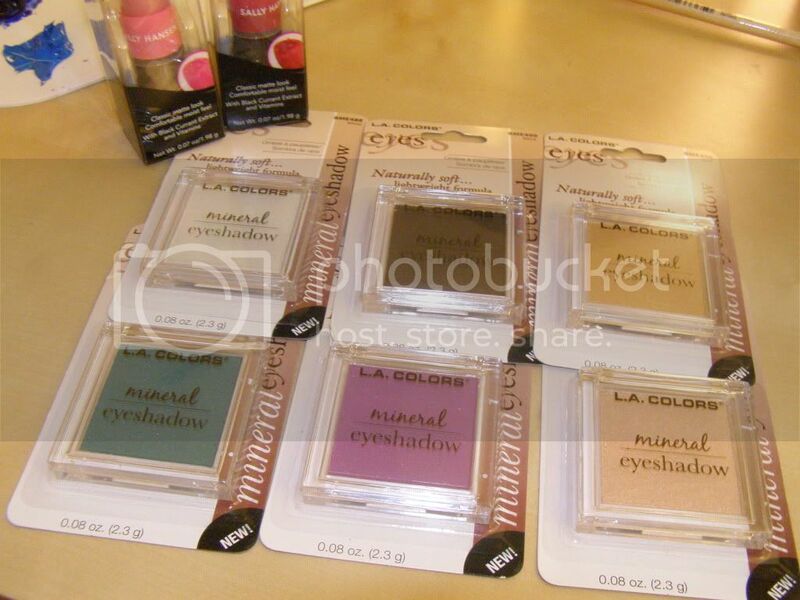 Our Dollar Tree only has crap; the only time I ever bought m/u there (a Maybelline l/g), it gave me a rash. Well, to be honest, I don't feel too bad about being a quad hog. People around here drive like assholes, I feel like they have it coming!